V8 snapshots are re-enabled (they were disabled for security reasons), there’s support for ES modules (behind a flag), and more. Starting with version 8.5 Node now supports ES modules natively. Here’s what you need to know. 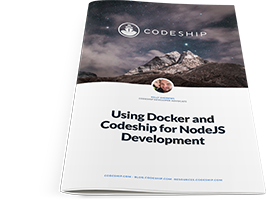 In this free eBook by Codeship Dev Evangelist Kelly Andrews you will learn how to use Docker and Codeship to develop and test a NodeJS app. Node Knockout is a popular 48-hour hackathon focused on Node development taking place Nov 11-12. It’s an online, virtual competition with contestants worldwide. Registration is now open. Explains timings in an HTTP request and shows how to measure them in Node to discover performance bottlenecks in client/server comms. An introduction to GraphQL features and concepts; plus how to build a simple GraphQL server. Recreating the passwordless authentication system introduced by Slack known as the ‘magic link’. Crystal is a compiled language with Ruby-esque syntax. If you haven’t upgraded yet, here are some reasons why you should. Oriented around Hapi, React, Postgres, and NGINX. GitHub repo. .. that supports an NGINX-like config.